We understand that a proper, comfortable fit is the key to buying new boots. That’s why we guarantee every custom fit we make. If after five days of use you find your fit unsatisfactory, we will adjust the fit at no charge, exchange the boot for another pair at a similar price, or give you store credit towards the purchase of a different pair of boots. That’s not just comfortable, it’s comforting! Our expert boot fitters have more than 100 years combined boot-fitting experience and have been trained by experts throughout the industry. 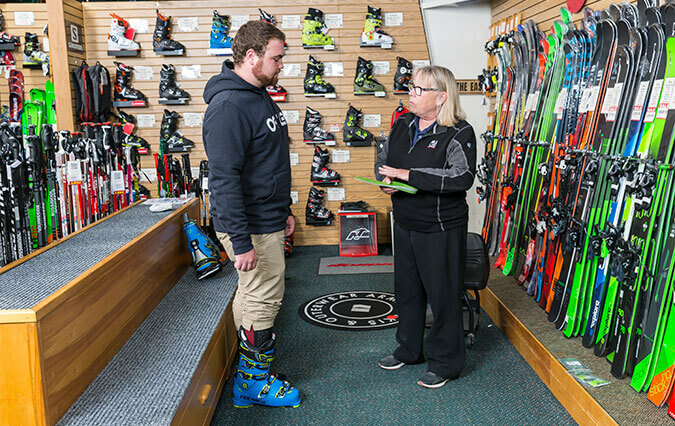 We will work with you to make sure your new boots maximize your comfort and performance out on the mountain. We also offer a ski performance guarantee, so you can have total peace of mind when you make your purchase that your new skis will be right for you. If after three days of use you are not happy with your new skis’ performance, we will exchange them for a new pair of equal value. We make every effort to put you in the best skis for your ability, but rest assured, if we don’t get it perfect the first time, we will work with you to get it right the next. This program is valid for current year model adult skis only. If you are not satisfied with your new skis, they can be exchanged for a new pair of equal value. We do not offer money back or store credit. The skis can be used up to three days within a 30-day period from time of purchase. Skis purchased prior to Christmas may be exchanged up until January 24th of the following year. All exchanges are based on the original retail price of both pair of skis. If the exchange is made after we put the skis on sale, the difference in the original price of the two skis will be charged or credited. Only one exchange allowed per customer, per year. Flat skis may be returned without bindings unless the consumer moves to a system ski. Exchanged skis must be undamaged and in reasonable condition.